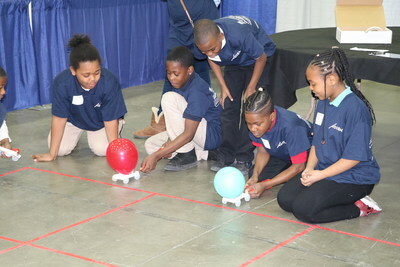 DETROIT, April 12, 2018 /PRNewswire/ -- Adient (NYSE: ADNT), the world's largest automotive seating supplier, sponsored the 12th annual JetToy Challenge at Cobo Center in Detroit. More than 500 students from Southeast Michigan make balloon-powered toy cars, competing in distance, accuracy, weight carrying and timed events. Students were part of SAE International's "A World in Motion" (AWIM) program, which brings together science, technology, engineering and mathematics (STEM) for a hands-on learning experience. Engineers volunteer their time in classrooms teaching STEM lessons to students in grades fourth through sixth. Adient is the global leader in automotive seating, located in Plymouth, Mich.
"The program introduces students to the world of science and technology," said Russ Burgei, Adient's vice president of engineering and program lead for AWIM. "The students are developing skills such as problem-solving and critical thinking that can be used in the real world." Adient joined the SAE program in 2008 and started the first ever district wide AWIM program in the world. Now the annual JetToy Challenge is open to schools in southeast Michigan and through special invitation for those from different states and countries. "By supporting project-based learning within our community, we hope to encourage students to pursue careers in STEM fields, hopefully at Adient," said Burgei. Adient is a global leader in automotive seating. With 85,000 employees operating 238 manufacturing/assembly plants in 34 countries worldwide, we produce and deliver automotive seating for all vehicle classes and all major OEMs. From complete seating systems to individual components, our expertise spans every step of the automotive seat making process. Our integrated, in-house skills allow us to take our products from research and design all the way to engineering and manufacturing – and into more than 25 million vehicles every year. For more information on Adient, please visit adient.com.